What Does a Casino Org Chart Look Like? Discussion in 'Non-Vegas Chat' started by marksind, Apr 14, 2019. Having recently spent ten days (March Madness first four days +) visiting South Point while staying across the street at the Grandview, I can't stop wondering how a place like that is managed. It's a small city. Hotel, big casino, five bars, eleven restaurants, two bowling alleys (60 and 72 lanes), 16 screen cineplex, two horse pavilions with over 1000 stalls, huge bingo room, several massive ballrooms, meeting rooms, gift shop/liquor store. How is a place like that organized at the departmental level? Is it "Hotel, Casino, Horses, Movies", etc.. Or is it "Food, facilities, staff", etc.? What's the hierarchy (org chart) look like? I was impressed with how well the place seems to be run. Haven't spent as much time at Sam's Town or Red Rock, and have never visited Green Valley Ranch, but the complexity appears to be comparable. Much more difficult than a place like the Downtown Grand, where we often stay. I know this is a question that board participants may find peculiar, but for some reason I can't shake it, so I thought I'd throw it out there. Anyone with any insight? Thanks. Here's a list of employee contact profiles from South Point, where you can get a better idea of the varied heads of departments, managers, directors, etc. It's 5 pages long and about 25 names listed (with job titles) on each page. Lots of different job titles are included, as well as heads of departments (but not all, for sure). This one guy basically does everything. I just noticed something about that pic. It's also going to vary by operator and the size of the operation. E.g. something like Cosmo is all stand-alone and it's going to be run under one chief with various departments. Something like MGM or CET has regional centralization over items like marketing and may have national oversight over areas like IT, HR, tax compliance, etc. Thanks. That's quite helpful. I'm not up on all these career websites, having pretty much stuck with Linkedin. Boy they've got a lot of departments, and it looks like they are a mix of activity (arena, bingo, bowling) and function (food, staff, catering). My favorite is Youth Program Coordinator (on the first page). Chapter head of Future Gamblers of America? 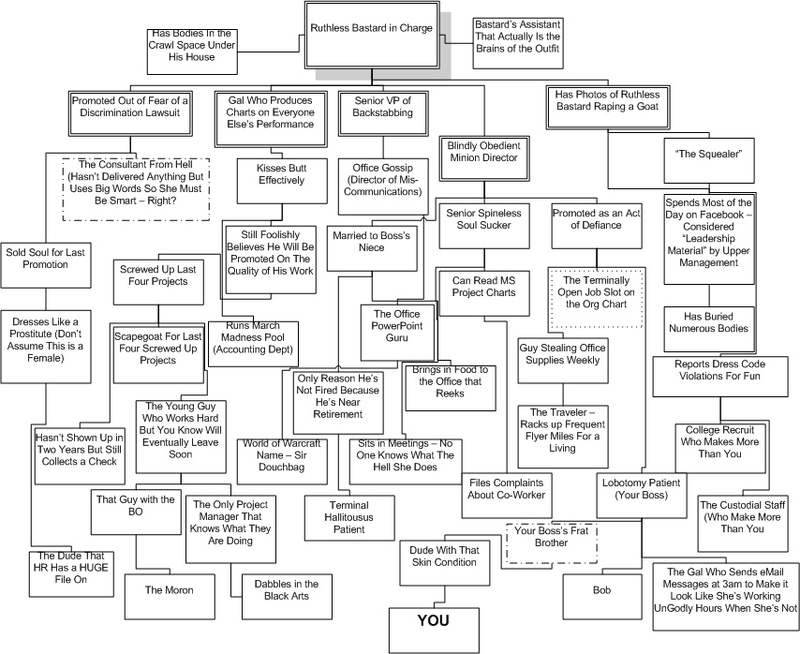 Breeze, that fake org chart is a pretty good description of my (former) employer. I always liked the comparison of a company being like monkeys in a tree. The ones above look down at a bunch of smiling faces, and the ones below look up at a bunch of a*sholes.